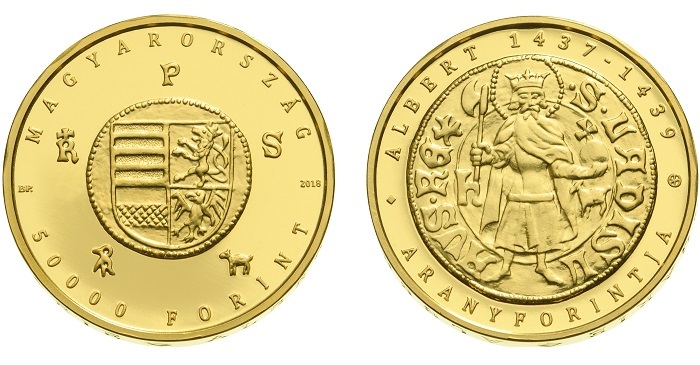 The only gold coin Hungary will issue in 2018 reaches back seven centuries, to the gold guldens (or florins) of King Albert for its inspiration. Albert of Habsburg (the Magnanimous), a descendant of King Bela IV, was crowned king of Hungary on December 18, 1437, after the death of his father-in-law, the Holy Roman Emperor Sigismund. Soon after that, he was named king of Bohemia, and in March 1438, he was named “King of the Romans,” although he was never crowned holy Roman emperor. He died in 1439 during a war with the Turks. 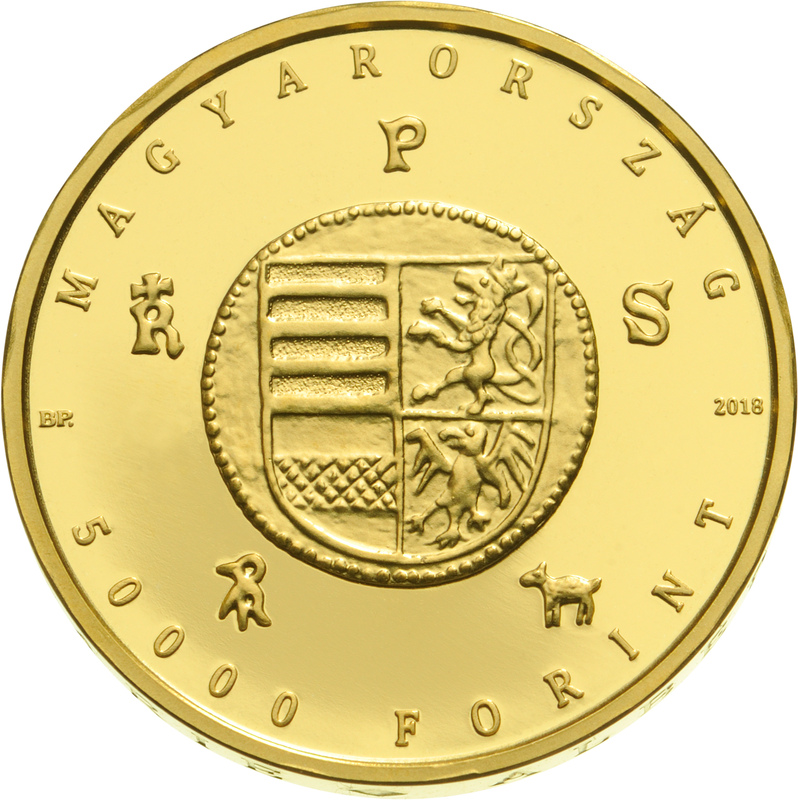 The 50,000-forint legal tender gold coin is modeled after a coin minted for Albert in 1439 now in the collection of the Hungarian National Museum. It corresponds to number 589 in the Huszar catalog and number 12 in Friedberg’s Gold Coins of the World. The obverse duplicates the original with a four-part coat of arms with stripes representing Hungary, a band from the Austrian shield, a Bohemian lion, and a Moravian eagle. 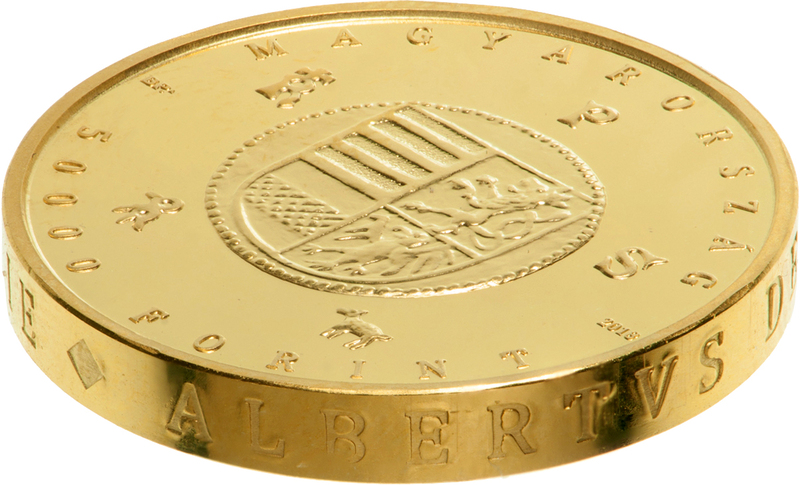 Encircling the coin are five of the mintmaster’s marks used during Albert’s two-year reign. 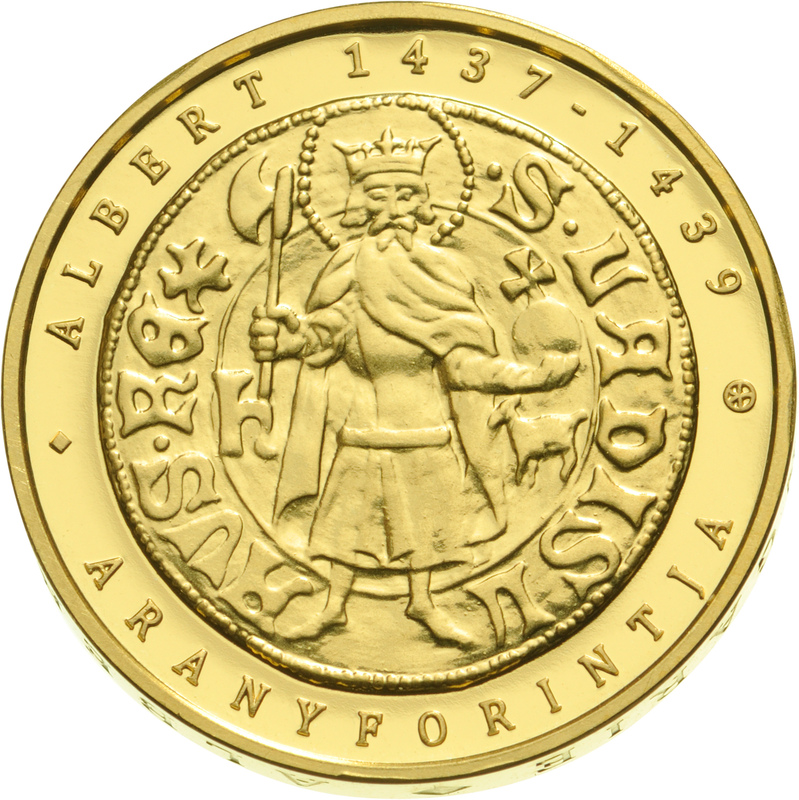 The reverse has an image of St. Ladislas standing holding a battle axe and orb. To his left and right are the letter “h,” representing the Hermannstadt Mint, and a lamb, the coat of arms of János Lemmel, the lord of the chambers who was in charge of minting. The 20-millimeter, .986 fine gold-ducat sized Uncirculated pieces that weigh 3.491 grams are available for $389.00 each. They are limited to 2,000 coins. 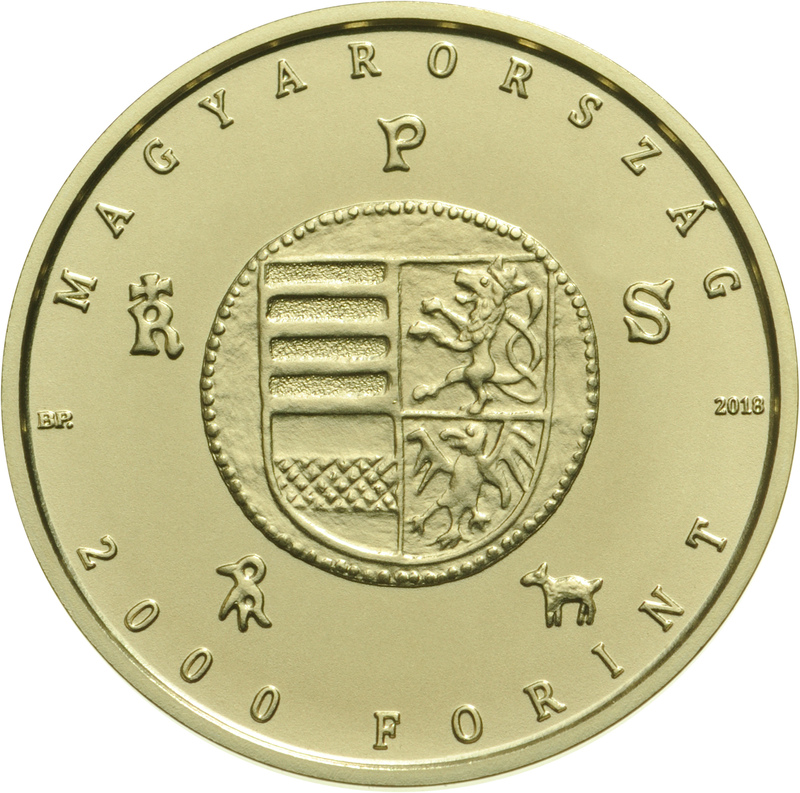 In addition, the Hungarian Mint is striking 500 quadruple-weight (13.964 grams) piéfort coins that are also 20 millimeters, but four times as thick and as heavy as the regular striking with the inscription ALBERTUS DEI GRATIA REX VNGARIE (Albert, king of Hungary by the grace of God) around the edge. While they last, this limited issue is available for $1,550. A copper-nickel-zinc Brilliant Uncirculated 2,000-forint version with the same design, weighing 2.7 grams and limited to 5,000 pieces is also available for $19.95. All three coins will be ready for delivery to North America by the end of April. This issue continues the series begun in 2012 with the gold florin of Charles I. Other issues were for Charles I (2012), Louis I (2013) and Mary, Queen of Hungary (2014), and Sigismund (2016).